If a baby fox, coyote, or bobcat is wandering around alone, without a mother in sight, or if it is laying by itself in the open, particularly if it is weak and easy to catch, it will need our help. 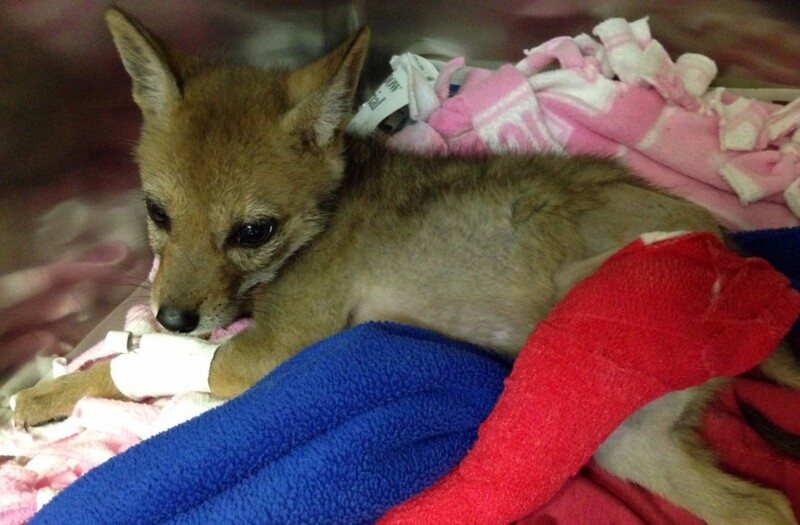 If a baby fox, coyote, or bobcat is with its mother and she is uninjured, please leave it alone. These animals can be very dangerous and move very quickly, even when injured, so we do not recommend trying to pick them up yourself unless you can do it safely. Contact NWRI for assistance in rescuing adult large carnivores. Sarcoptic mange is a common affliction in coyotes and foxes, and commonly occurs when they are immune –compromised for some other reason (starvation, illness, injury, etc.). It is characterized by hair loss and constant scratching. Minor cases of mange can be treated in the wild by dropping medicated bait. Severe cases of mange and cases of mange that are accompanied by other injuries or illness, will need to be treated in captivity. Please contact us for further information on treating mange.